Just a quickie here to tell you all about a revelation that J and I had recently: hummus? AWESOME on pizza. 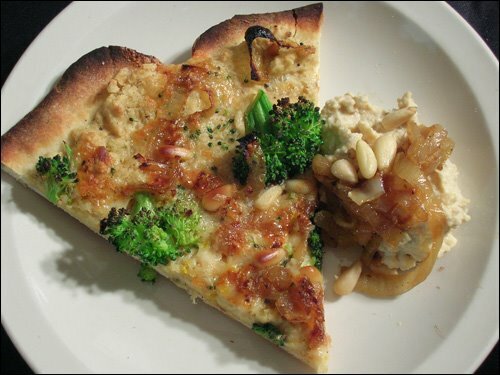 This particular specimen was made with an appropriately Mediterranean spin, beginning with a generous layer of hummus (a very simple basic recipe flavored with lemon, olive and garlic) topped with chopped fresh broccoli, caramelized onions, pine nuts, and a modest finish of shredded sharp cheddar and grated parmigiano reggiano (the good stuff), all on homemade pizza dough. This was utterly satisfying as a pizza dinner, despite being way light on the usual fatty toppings. The hummus itself was actually extremely low-fat, because I used some of the liquid from the can of chickpeas to thin it out rather than a whole crapload of olive oil, and made up for the lack of olive flavor by tossing a couple of chopped brined green olives into the food processor. It came out delicious and you’d never know there was virtually no fat added (just 1 tbsp of olive oil for a little richness on the tongue). We’ve made practically guilt-free pies before by using skim milk ricotta or part-skim mozzarella, but unsurprisingly those pies would never hold a candle to this one when it comes to flavor and all around tummy satisfaction. It was delicious. I hope the pizza police aren't going to come knocking down my door over this, because seriously, its delicious. Now, I’m wondering just how far we could take this variation to mimic a real NY Italian-America pizza. Chickpeas are pretty much a blank slate when it comes to flavor – I mean sure, they have a taste all their own but they mix well with almost anything. Could we season the hummus with Italian herbs and spices to make a better fake-out for ricotta on a white pie? Could we add fresh tomatoes and basil to the hummus to make sort of a thick marinara paste? I’m not sure, but I totally want to try. And I want to explore the Greek and Mediterranean angle as well – topped with black olives and crumbled feta and Greek-style braised or sauteed greens, man would this be tasty. Or perhaps chicken souvlaki and thin slices of haloumi, cooked under the broiler till golden brown and crispy, then topped with a light, crisp, fresh cucumber salad. Mmmm. Am I drooling? Sorry. And who says this variation should be relegated to chickpeas? 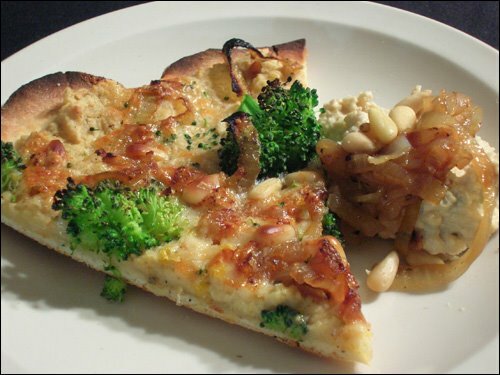 Why not white beans in one of those Italian-style applications, or black or pinto beans to make a Mexican pizza? (Because we all love those – go on, admit it.) It’d be easy to mimic refritos on a pizza this way, without the extra, well, frying. In lard. Which is delicious, but not something I can really allow onto our dinner plates very often. Can't wait to experiment some more with this. And as an added bonus to those of you (read: all of us) who are trying to save money on everyday food, this was seriously cheap to make. 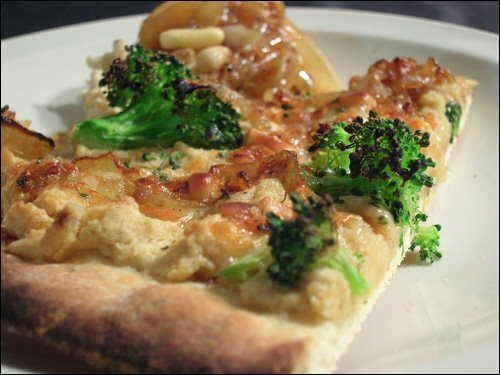 Less than $1 for a can of chickpeas on sale, and pennies’ worth of flavoring ingredients added to make the hummus; half an onion, a small head of broccoli, probably less than $2 worth of cheese; pizza dough is nothing bu flour, yeast, and water in its most basic form, all very inexpensive if you’re like me and buy them in bulk; and the pine nuts, while very tasty here, are really an unnecessary indulgence and could be omitted in the interest of tightening the belt a bit more. All told, when you consider that most of what went into this pie were pantry items for us, this couldn’t have cost more than $5 or so to make. Not bad, considering how filling and delicious it was. At any rate, I’d encourage anyone who likes hummus to give this a shot – even if you’re not aiming for low-cal or don’t care about your fat intake, try it anyway. Its still an incredibly flavorful way to approach pizza in a new way. This entry was posted in Food, Drinks and Cooking, Table for Two? Archives and tagged cheese/dairy, dinners, greek/mediterranean, pizza, vegetables. Bookmark the permalink.